A pictoral journey of road and rail vehicles of the past. Today the West Coast is known for its beauty, tourist and mining industries, but in days past it was also known for its timber, railways and its isolation from the rest of Tasmania. The only way one visited the west was the Emu Bay railway that ran from Burnie to Zeehan, or by sea travelling from the north or from Hobart in the south, a voyage that could take up to a week. With the opening of the West Coast road in 1932 the west could now be reached by road transport. 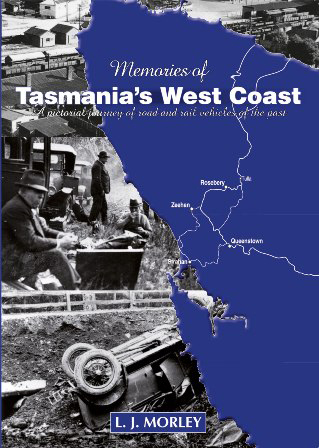 Memories of Tasmania’s West Coast is a pictoral journey through the construction of the West Coast road, the Great Lake road to Bronte, the Tarraleah road, and the Queenstown to Zeehan road, now all highways. We see the hydro scheme take shape and the trucks that once worked at the Mount Lyell Copper Mine, the bus companies that pioneered the bus routes along with the first transporters, motorists and other road users.